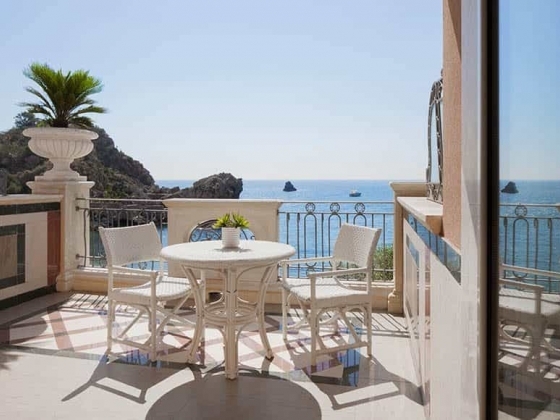 Taormina, one of the most scenic places in the world, comparable, for its shape, to a sort of terrace featuring a panoramic view of Mount Etna and the blue Ionian Sea. 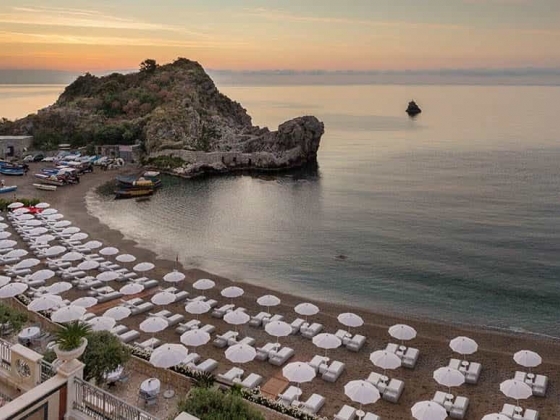 In the fabulous valley, one of the most picturesque Baie on the east coast of Sicily, surrounded by two rock formations, was born, in the magical and unforgettable 60s Taormina, Grand Hotel Mazzaro Sea Palace, the pride of Taormina luxury accommodation. Many guests have left the signature of the "book of remembrance" of the Grand Hotel, where will be transformed in 'friend” who will stay long, returning. 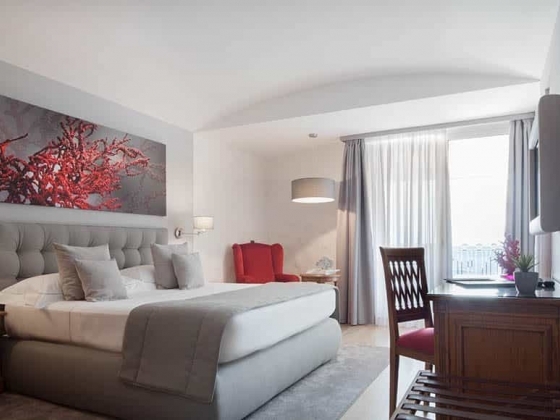 For this reason, perhaps, when you enter in one of the rooms of the Grand Hotel, you have the feeling of returning to a place that is already known. 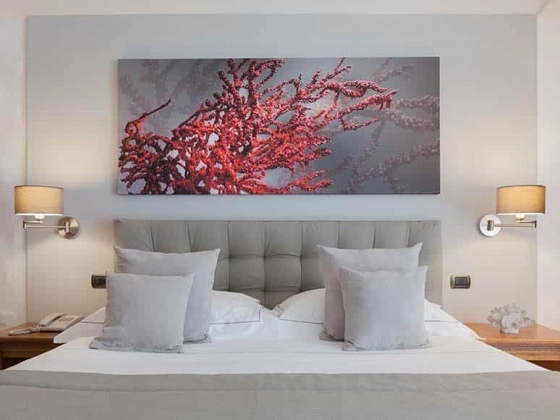 The colours, the absolute comfort and tranquillity of 'hotel will enable to feel immediately at ease. 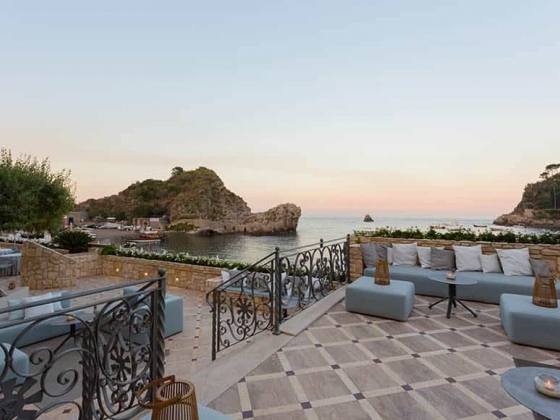 The sumptuousness of the marble of Carrara, a private beach, a unique decor, the possibility of having breakfast on the sea, the Piano bar for closing a day full of emotions to start an evening full of surprises, the picturesque Bay of Mazzarò, the rooftop terrace with pool. 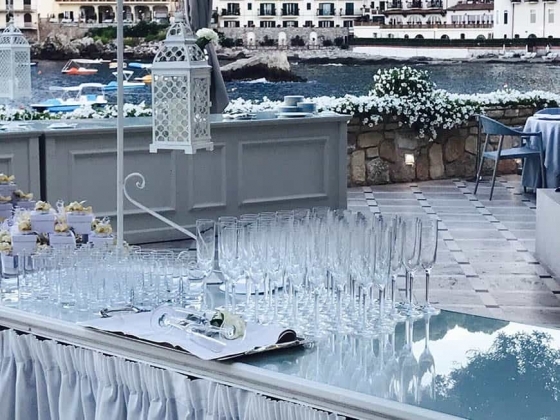 All this helps to create the place that the Grand Hotel Mazzaro Sea Palace provides for your wedding. 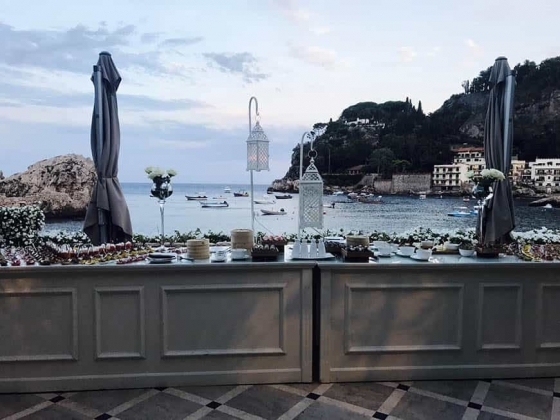 An event, a wedding dinner, a gala banquet at the Grand Hotel Mazzaro Sea Palace thus become the supreme opportunity to celebrate an important event without concessions to the extravagance and yet in the exclusive luxury of a high-class cuisine and spectacular atmosphere. 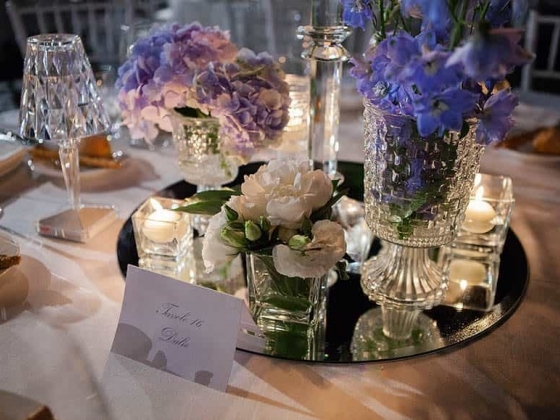 To impress upon the memory of a cherished moment, contribute the colours, the sounds but also the flavours that gradually take turns in the unfolding of an event. The dishes that the Mazzaro Sea Palace chefs offer to customers are the result of the combination of research and creativity, always in perfect balance between tradition and innovation. The restaurant Il Gattopardo, located in the building, features elegant rooms, where you can host the banquet for up to 250 guests. The beauty of the hall is more enriched by the presence of a large window with a panoramic terrace on the seaside. 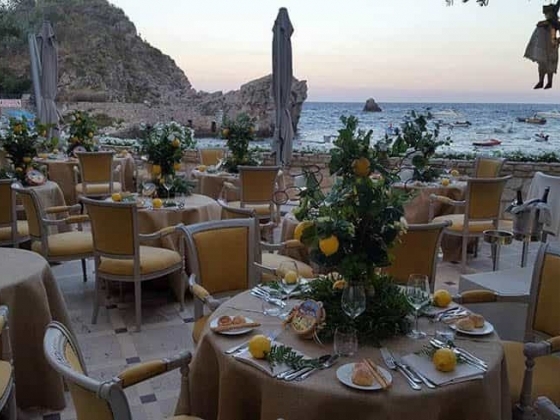 Each event is curated by the expert staff of the resort which will be delighted to organize every aspect of your banquet, relying on experience and refined taste. 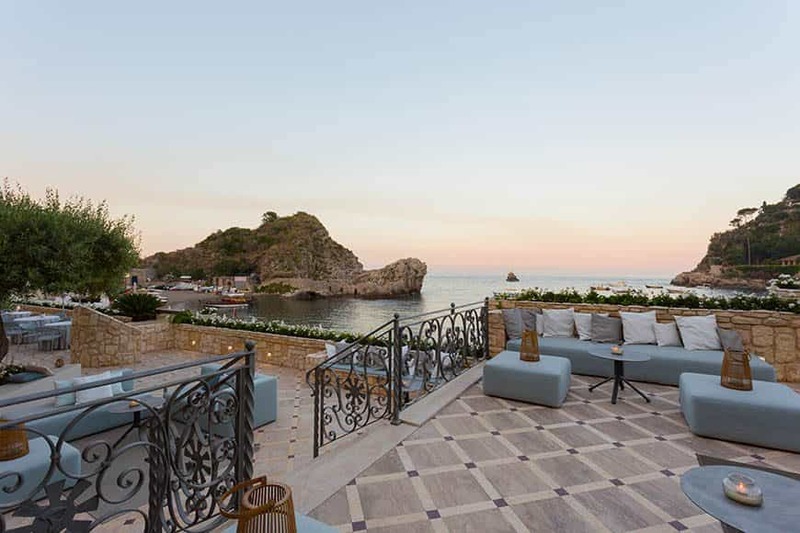 And then the music, the colours of the fireworks, the shows, the terrace overlooking the sea to ensure, for those looking for excellence, the total involvement of the senses. Venue Capacity: Banquet for up to 250 guests. 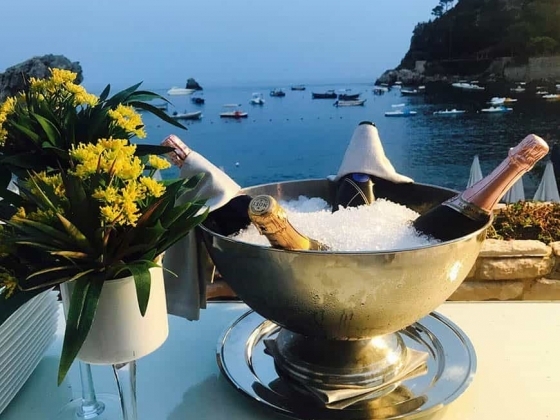 Evening Entertainment: And then the music, the colors of the fireworks, the shows, the terrace on the sea to ensure, for those looking for excellence, the total involvement of the senses. 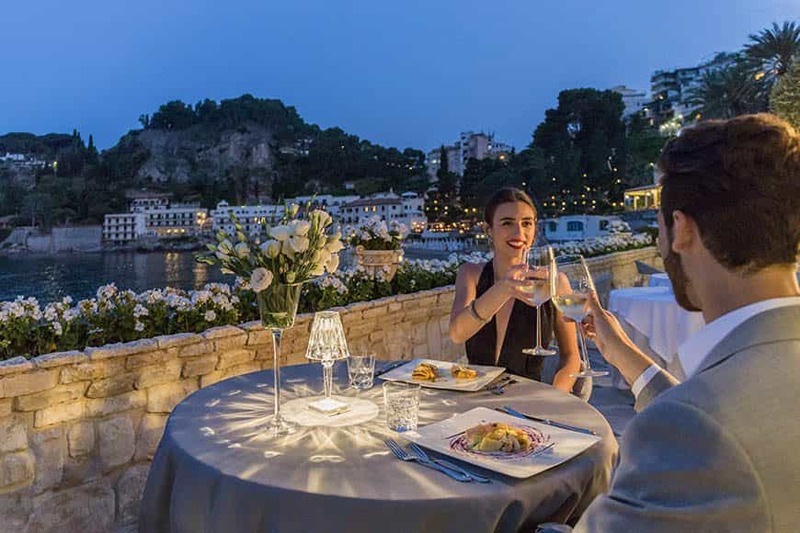 Accommodation: The Grand Hotel Mazzarò Sea Palace has 88 rooms, including bridal suites, junior suites and suites with a private pool on the terrace. 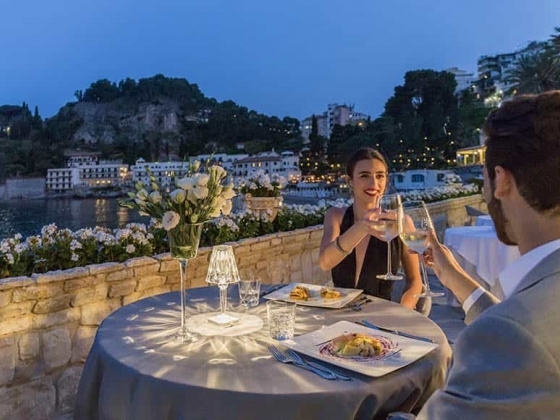 Dining Options: A reception, a wedding dinner, a gala banquet at the Grand Hotel Mazzaro Sea Palace become the supreme opportunity to celebrate an important event in the exclusive luxury of a high-class cuisine and spectacular atmosphere. Swimming Pool The swimming pool is located on the top floor where you will also find a long sun terrace and the Blue Bar. The swimming pool may be used all year round as it is covered and the water is heated in the winter. Fitness Center You can’t beat water sports or a simple swim in the bay for exercise at Mazzarò Sea Palace, but there is also a fully equipped, up-to-date fitness center available for those who want one. 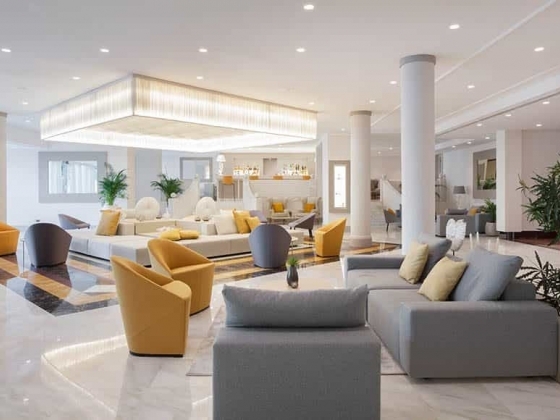 Spa Just recently opened, the HYD’OR Wellness Center at the adjoining Grand Hotel Atlantis Bay is a wonderful experience for Grand Hotel guests who enjoy all aspects of wellness. We are a bespoke wedding and events planning service working in London, South-East England, the UK and the world creating elegant, unique, fun and beautiful celebrations for our clients. Stitched Forever is a personalised embroidery company that specialise in weddings and big occasions. We offer a highly tailored and bespoke service which can be colour coordinated to suit your wedding.